HTET Latest News 18.04.2019 : As per the latest news about Haryana TET Exam 2018, Last Chance for Biometric Verification of HTET 2018 can be completed up to 26.04.2019. HTET Statistical Report for all three levels has also been uploaded on 04.04.2019. Official answer key of HTET PGT Exam JAN 2019 for Level-3 & Level-2 was released on 07.01.2019. HTET JBT-TGT-PGT Exam was held on 05 & 06 January, 2019. HBSE had uploaded answer key objection notice for HTET 2018 held as per the schedule. 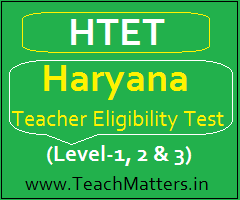 About HTET 2018 : Haryana TET held in 2017 was HTET 2015-16. HTET 2015 held in November 2015 (for Level-I & II) and June 2016 (for Level-III) was HTET 2014-15. It is the fact that HTET is not conducting regularly as per the schedule. So, there is confusion when we talk about the current HTET Exam. So, HTET 2016-17 (or HTET 2017) may be called HTET 2017-18 (2016-17 exam to be conducted in 2018) or HTET 2019 (to be conducted in 2019). This exam may be called as HTET JAN 2019 if it is conducted in January 2019. HTET Answer Key 2018 for Level-3, Level-I, Level-II & Level-III has been posted here as and when official answer key. HTET 2018 Answer Keys for PGT, TGT & JBT exam has been uploaded by HBSE on 07.01.2019 on www.bseh.org.in as per the schedule. HTET 2019 Answer Key exam held on 05-06 January 2019 all three levels - Level-1,2&3 can be downloaded here immediately after the completion of the exam. We at www.teachmatters.in have provided tentative and unofficial answer key of HTET Exam JAN 2019. HTET Answer Key of 05-06 January 2019 exam are published here after the exam as (HTET PGT Answer key) & (HTET JBT & TGT Answer keys). The candidates of HTET 2018 can see/download here HTET Jan. 2019 Answer Key (official & final). HTET Answer key for level-1 (JBT), level-2 (TGT) & level-3 (PGT) can be searched here for 2019 January exam. Download link for HTET Answer key for level-1, level-2 and level-3 have been provided here at the below links. HTET 2018 Result for Level-3 (PGT), Level-2 (TGT) & Level-1 (JBT) exam held on 05 & 06 January 2019 will be published here as per the schedule. The Result of HTET JAN 2019 will be uploaded by HBSE on the official website. How to check HTET Result 2018 ? Enter 'Roll No., Date of Birth, Level & Security Pin' & submit it. View your result and take print-out of HTET Result 2018 for future reference. Candidates will be able to check their result as the result is declared on the official website. HTET Result 2019 for Level-3, Level-2 & Level-1 is declared under these categories. .
HTET OMR Photo Copy of HTET Exam 2018 for level-3, level-1 and level-2 is available on the official website of BSEH i.e. www.hbse.ac.in or www.bseh.org.in. HTET OMR Sheet Images can be downloaded within 60 days from the declaration of the result. HTET OMR Photocopy Form is available at BSEH website. Dates for Downloading of OMR Sheet Images : Within 60 Days of the declaration of HTET Result. HTET Question Papers of JAN 2019 exam held on 05-06 January 2019 for level-1 (JBT), level-2 (TGT) & level-3 (PGT) are available here for all subjects and levels. HTET JAN 2019 exam was conducted only through Conventional OMR Sheet traditional type (offline) mode. Here are the question papers of HTET January 2019 to download as .pdf. Candidates who have applied online for HTET exam 2018 can download their Admit Card / Roll No. / Hall Ticket and Exam Centre from the official website of HTET i.e. www.htetonline.com or HBSE's website i.e. www.hbse.ac.in as per the schedule. Candidates are required to enter their registration no. and password in order to download their admit card for HTET January, 2019. Follow the below steps to download HTET Admit Card for 2018-19 exam. Click 'Download Admit Card for HTET January 2019. Fill up all required details as Registration no., Password. Print both copies of Admit Card as one copy is to be submitted to the Centre Superintendent. HTET Online Application 2018 : HBSE has issued Detailed Notification for HTET 2018 and Online Application for HTET JAN 2019 was started from 19 November, 2018. As, we earlier reported, HTET Online Application has been started in third week of November, 2018. The Board will conduct Haryana Teachers Eligibility Test (HTET) 2018 in the month of January, 2019 for Level-I (JBT), Level-II (TGT) & Level-III (PGT / Lecturer). Note : Link for HTET JAN 2019 Online Application, Detailed Notification, Syllabus, Eligibility Criteria, Exam Pattern & Exam Schedule are given below. This time HTET will be conducted through offline mode only - Offline (Traditional Method - Paper based test). BSEH has also made Adhaar Card mandatory for HTET. Eligible candidates can apply online as per the schedule through official website i.e. www.htet.nic.in. Here is the full detail. HTET 2018 will be conducted through offline mode i.e. Conventional Type (Pen-Paper Based) only. HTET 2018 - Offline Test - Offline (Traditional Method) will be same as the previous method adopted by HBSE. There will be 150 MCQ (Objective Type) carrying 150 Marks - one mark for each question. HTET 2018 - Online Test (CBT - Computer Based Test) - HTET 2018 CBT will not be conducted through online mode. Candidates can apply online for HTET 2018 through official website of HTET i.e. www.htet.nic.in or HBSE website i.e.www.bseh.org.in or www.hbse.ac.in as per the schedule. Click 'Apply Online for HTET 2018'. Choose the level/s for HTET and fill up all required details. Pay the challan fee at the bank you choose. Take print-out of the Application. For other details visit official website i.e. www.htet.nic.in or keep with us for latest updates on HTET JAN 2019 like Exam Scheme, Eligibility Criteria, Admit Card, Practice Sets, Solved Question Papers, Answer Keys and Results. BSEH will issue a letter regarding instructions for HTET 23-24 December exam. The board will made special provisions for the blind and disabled candidates. The differently abled candidates including blind and those who will not able to write with their own hands can avail the facility of scribe/amanuensis and can request the Centre Superintendent for amanuensis two days before the day of exam. The candidates can check fee confirmation list after the completion of online application form of HTET 2017. Candidates can confirm their fee on the official website of HTET i.e. www.htetonline.com. Fee confirmation link for HTET 2017-18 will be available as per the schedule. Fee defaulter candidates of HTET 2017 will have to report Special exam branch, along with valid ID proof and copy of Fee Challan in support of fee deposited in Bank, as per the schedule. Candidates who will register themselves more than once in the same level for HTET 2017 will be directed to report AS (special exam.) room no 28 at Board's H.Q with valid ID proof and attested copy of matric/secondary examination as per the schedule (07.12.2017 to 09.12.2017). Last year TET exam was held in 2015 for Level-1 & 2 and 2016 (June) for Level-3 PGT. It was HTET 2014-15 Exam which was conducted in 2015-16. Here are important facts and details of previous year Teacher Eligibility Test conducted by BSEH. HTET Result 2017 PGT Exam June 2016 : The BSEH (on 04.08.17) declared Revised Result of HTET Level-3 PGT Exam June 2016 for benefit of 5 marks due to court case decision. The result of HTET PGT Level-3 Exam June 2016 was declared on 25.07.16 and the Final Answer keys of the exam was uploaded on 19.10.16. Candidates who appeared in HTET Level-3 Exam 18.06.2016 can check their result and final answer keys here provided by the official website. Here is the statistical report and result analysis of HTET Result June 2016 held on 18.06.2016 for PGT Level-3. A total number of 108833 candidates appeared in the PGT exam and 8963 candidates were appeared in Computer Based Test. Here is the detailed analysis. Download Subject-wise Statistical Report of HTET Level-3 Exam June 2016 at the below links. HTET Answer Key 2015-16 for Level-3, Level-I, Level-II & Level-III are available here as official and final answer key. HTET 2016 Answer Keys for PGT, TGT & JBT can be get here. Revised and Official Answer key of HTET 2016 was uploaded by HBSE on www.htet.nic.in. Final and Official answer key of PGT Exam June 2016 can be get here. Candidates can download official and final answer key of HTET June 2016 PGT exam here for all codes - A, B, C, D and E along with all Subjects - Hindi, English, History, Maths, Pol. Science, Economics etc. Download HTET 2015 Answer Key exam was held on 14-15 November, 2015 for all three levels - Level-1,2&3. Download HTET Question Papers of June 2016 exam held on 18.06.2016 for Level-3 (PGT) and November 2015 exam held on 14-15 November 2015 for level-1 (JBT), level-2 (TGT) & level-3 (PGT). HTET Nov. 2015 exam was conducted through Conventional OMR Sheet traditional type (offline) mode and Computer Based Test (CBT) (Online) mode. Here are the question papers of HTET Nov. 2015 to download as .pdf. I requested to board to fill again Home district because some applicant migrate time to time. Sir jinhone objection kiye h unka kya krte h ye hmme kaise PTA lgega ?